We’re just three weeks into the NFL season but storylines have already developed throughout the league. Here’s a rundown of what’s going on, by division. The 3–0 Bengals are the real deal in NFL 2015. On the offensive end, Andy Dalton has been explosive, culminating in a career-high 383 yards passing in Week 3, with 3 touchdowns to boot. Dalton now has totals of 866 yards, 8 touchdowns, and a 121.0 passer rating on the season. In terms of the weapons he’s throwing to, he not only has premier target A.J. 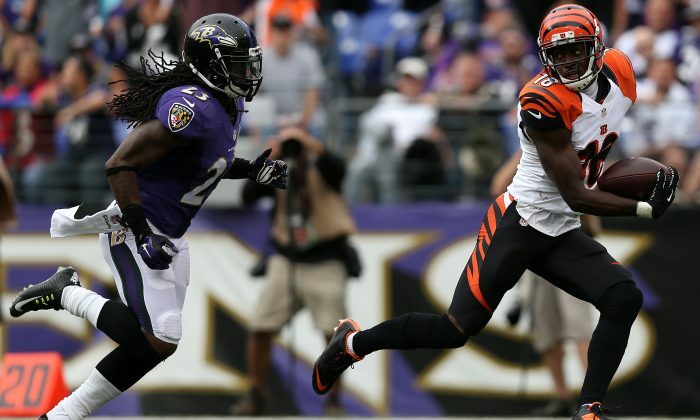 Green, but WR Marvin Jones and TE Tyler Eifert have also proven to be effective playmakers. On a side note, it’s Steve Smith’s last season, but he can be easily mistaken for a young receiver in the prime of his career. The ageless one caught 13-17 targets for 186 touchdowns and 2 touchdowns in Week 3. Marcus Mariota continues to be solid as Andrew Luck continues to be paltry, though Luck got the win in Week 3’s Titans–Colts bout. Meanwhile, Texans QB Ryan Mallett had a strong showing in the Texans’ 19–9 victory over the Buccaneers. For all the talk about how Manning has regressed, the Broncos are sitting pretty at 3–0. Manning looked a lot more comfortable in Week 3 after the Broncos reverted back to the shotgun offense, finishing Sunday night with 324 yards and 2 touchdowns. Manning aside, the real strong point of the Broncos has been their defense. The defensive line has been incredibly stout, and behind the line, LB Brandon Marshall and SS T.J. Ward are quick to clean things up. Especially notable is OLB Von Miller, who continues to be one of the league’s most dominating pass-rushing forces and was absolutely ruthless Sunday night versus the Lions. The AFC East may very well be at its most competitive point in the past few years, but it is still a division dominated by the Patriots. Using the same old formula of precision passing by Tom Brady, an uncoverable Rob Gronkowski, and an impenetrable offensive line, the Patriots have been decimating opponents offensively thus far. They walloped the Jaguars 51–17 in Week 3. The major story of the NFC North is that Adrian Peterson is back. Against the very team he posted his 296-yard single-game rushing record against, Peterson forced an absurd 10 missed tackles and gained 109 yards after contact en route to 126 total rushing yards, 184 yards from scrimmage, and 2 touchdowns in a 31–14 Viking victory. Farther east along the north border, Matt Stafford continues to perform like one of the league’s lower-tier quarterbacks, though it’s unfair to talk about Stafford’s struggles without mentioning the sieve-like offensive line “protecting” him. The Falcons are 3–0. Highlighting their early season dominance is the steady Matt Ryan–Julio Jones combo on the offensive end. Also notable is stellar play from second-year LT Jake Matthews, whose struggles were well-documented in his rookie season. On defense, rookie OLB Vic Beasley has been one of the league’s best rookies in the early season, and is one to take note of. Following the tale of quarterbacks around the league, Cam Newton was excellent in Week 3, Drew Brees is injured, and all eyes will continue to be on the No. 1 overall pick Jameis Winston, who shows flashes but needs to work on consistency (as with most rookies). Winston completed 17-36 passes for 26 yards with a touchdown and an interception versus the Texans in Week 3. On one end of the spectrum is the re-emergence of Carson Palmer. The 35-year-old veteran is one of the best quarterbacks in the league right now. Through three weeks, Palmer has totaled 803 yards, 9 touchdowns, and a 117.8 passer rating. As a direct benefactor, WR Larry Fitzgerald has 333 receiving yards and 5 touchdowns through three games. On the other end of the spectrum is Colin Kaepernick, who posted an abysmal statline in Week 3, completing 9-19 for 67 yards and four interceptions in the 49ers’ 7–47 demolition at the hands of the Cardinals. And this was only a week after his monster 33-46 for 335 yards performance in Week 2. Consistency is really an issue for the 49ers QB, and if these fluctuations continue, the 49ers really will have to confront the issue of whether Kaep is a capable long-term NFL starter. The NFC East right now is still a division of relative struggle. The Cowboys are dealing with injuries, and the Redskins’ hopes lie on the erratic arm of Kirk Cousins. Meanwhile the Giants and Eagles finally turned things around with their first wins of the season in Week 3. Normally the best stock-picking advice involves P/E ratios, chart-watching, and 52-week high/lows. Now you can just watch Monday Night Football instead.